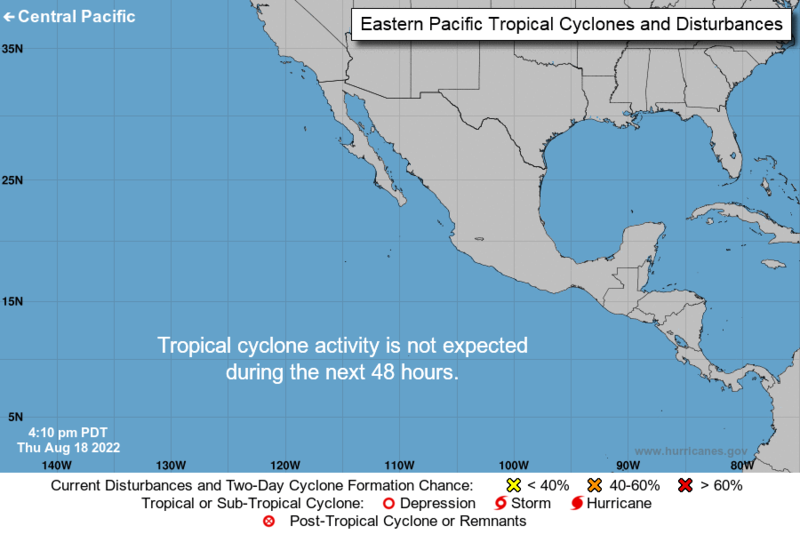 FZUS56 KLOX 230340 CWFLOX Coastal Waters Forecast National Weather Service Los Angeles/Oxnard CA 840 PM PDT Mon Apr 22 2019 Point Piedras Blancas to San Mateo Point CA out 60 NM including the Channel Islands National Marine Sanctuary 840 PM PDT Mon Apr 22 2019 .Synopsis for the southern California coast and Santa Barbara Channel including the Channel Islands National Marine Sanctuary and National Park...at 03Z...or 8 PM PDT...A 1032 MB surface high was centered 800 NM W of Point Conception with a 1008 MB low in AZ. Gusty NW winds will affect the outer waters through late tonight, along with choppy seas. NW winds 10 to 20 kt with gusts to 25 kt in the evening, becoming 5 to 10 kt late. Combined seas 5 to 6 ft dominant period 10 seconds, subsiding to 3 to 5 ft dominant period 10 seconds after midnight. Patchy dense fog with VSBY 1 nm or less. NW winds 5 to 10 kt. Wind waves 2 ft or less. NW swell 3 to 5 ft at 10 seconds. NW winds 10 kt in the evening, becoming variable 10 kt or less. Wind waves 2 ft or less. NW swell 3 to 4 ft at 9 seconds. N winds 5 to 10 kt, becoming W in the afternoon. Wind waves 2 ft or less. NW swell 4 to 5 ft at 9 seconds. Winds variable 10 kt or less. Wind waves 2 ft or less. 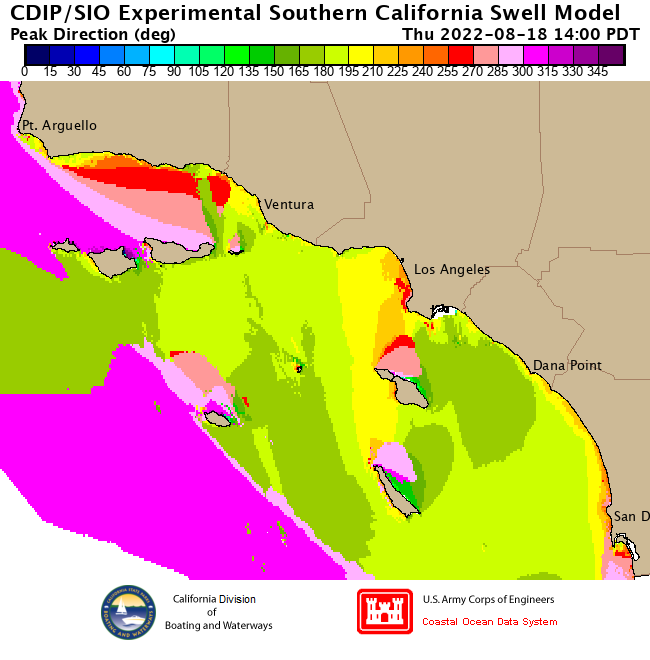 NW swell 4 to 5 ft at 8 seconds. Winds variable 10 kt or less. Wind waves 2 ft or less. NW swell 3 to 5 ft at 12 seconds. Winds variable 10 kt or less. Wind waves 2 ft or less. NW swell 3 to 4 ft at 9 seconds. Winds variable 10 kt or less. Wind waves 2 ft or less. NW swell 3 to 4 ft.
W winds 5 to 10 kt. Wind waves 2 ft or less. 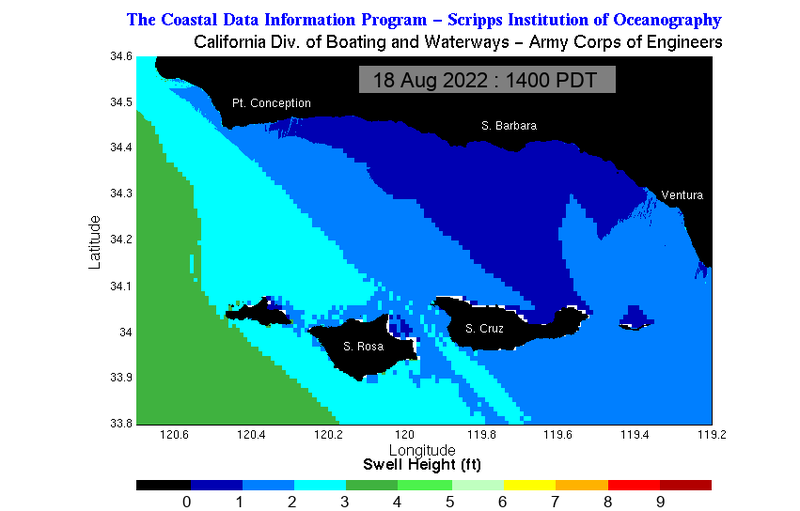 NW swell 3 ft.
NW winds 20 to 30 kt, becoming 10 to 20 kt with gusts to 25 kt after midnight. Combined seas 6 to 8 ft dominant period 10 seconds. NW winds 10 to 15 kt. Wind waves 2 ft or less. NW swell 4 to 5 ft at 10 seconds. NW winds 10 to 15 kt, becoming 15 to 20 kt after midnight. Wind waves 2 to 3 ft. NW swell 4 to 5 ft at 9 seconds. NW winds 10 to 20 kt. Wind waves 2 to 3 ft. NW swell 5 to 6 ft at 9 seconds. NW winds 10 to 15 kt, becoming 5 to 10 kt after midnight. Wind waves 2 ft or less. NW swell 5 to 6 ft at 8 seconds. NW winds 10 to 15 kt, becoming 10 kt in the afternoon. Wind waves 2 ft or less. NW swell 4 to 5 ft at 12 seconds. Winds variable 10 kt or less, becoming NW 5 to 10 kt after midnight. Wind waves 2 ft or less. NW swell 3 to 4 ft at 10 seconds. NW winds 5 to 10 kt. Wind waves 2 ft or less. NW swell 3 to 4 ft.
NW winds 10 to 15 kt. Wind waves 2 ft or less. 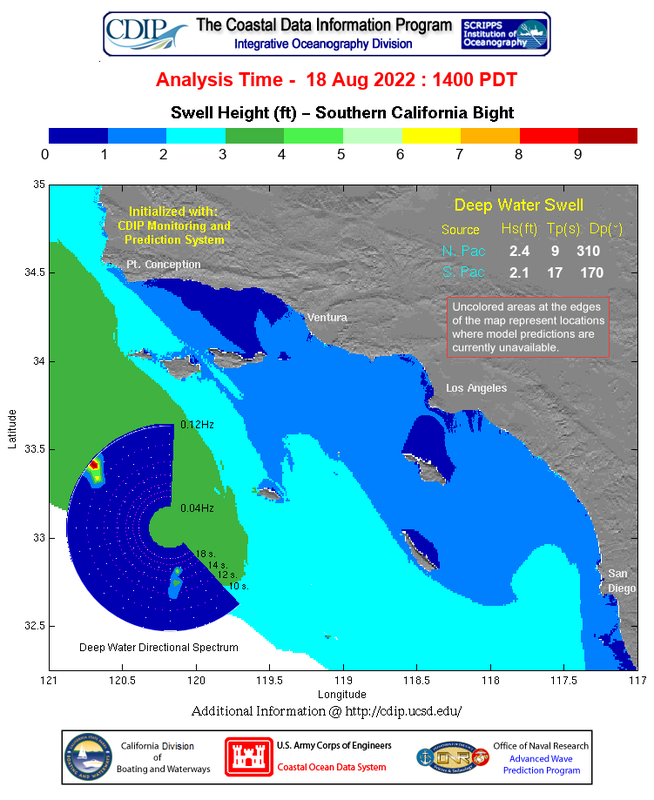 NW swell 3 ft.
NW winds 20 to 30 kt, becoming N 10 to 20 kt with gusts to 25 kt after midnight. Combined seas 6 to 8 ft dominant period 10 seconds. NW winds 10 to 15 kt. Wind waves 2 ft or less. NW swell 3 to 4 ft at 9 seconds. NW winds 10 to 15 kt, becoming 10 kt in the afternoon. Wind waves 2 ft or less. NW swell 4 to 5 ft at 9 seconds. NW winds 10 kt in the evening, becoming variable 10 kt or less. Wind waves 2 ft or less. NW swell 5 to 6 ft at 8 seconds. NW winds 5 to 10 kt in the morning, becoming variable 10 kt or less. Wind waves 2 ft or less. NW swell 4 to 5 ft at 12 seconds. Winds variable 10 kt or less. Wind waves 2 ft or less. NW swell 3 to 4 ft at 10 seconds. NW winds 15 to 25 kt with local gusts to 30 kt. 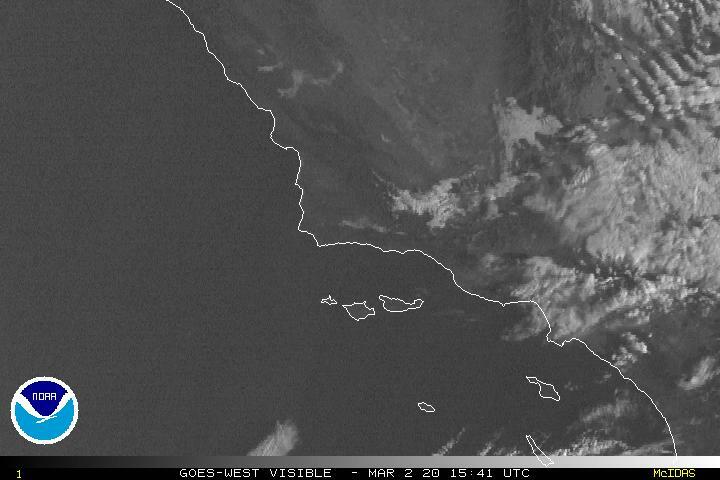 Strongest NW of San Nicolas Island. Combined seas 5 to 7 ft dominant period 10 seconds. N winds 10 to 15 kt, becoming W in the afternoon. Wind waves 2 ft or less. W swell 3 to 5 ft at 10 seconds. W winds 10 to 15 kt. Wind waves 2 ft or less. W swell 3 to 4 ft at 9 seconds. W winds 5 to 10 kt. Wind waves 2 ft or less. W swell 3 to 5 ft at 9 seconds. W winds 5 to 10 kt. Wind waves 2 ft or less. 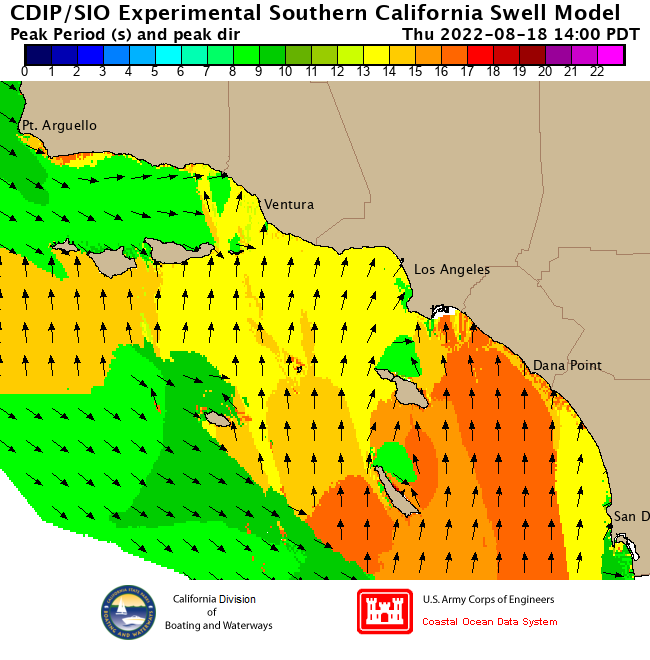 W swell 3 to 5 ft at 8 seconds. Winds variable 10 kt or less. Wind waves 2 ft or less. W swell 3 to 5 ft at 12 seconds. Winds variable 10 kt or less. Wind waves 2 ft or less. W swell 2 to 4 ft at 10 seconds. W winds 5 to 10 kt. Wind waves 2 ft or less. W swell 2 to 4 ft.
W winds 10 to 15 kt. Wind waves 2 ft or less. 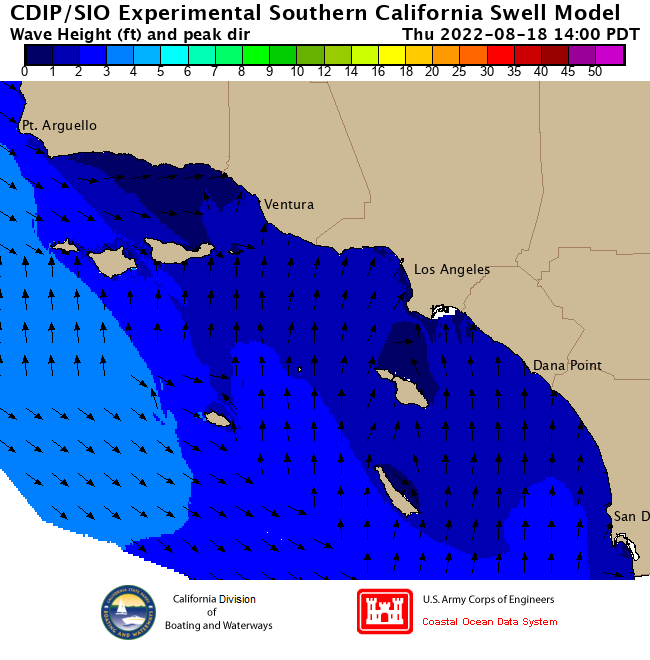 W swell 2 to 3 ft.
W winds 15 to 20 kt, becoming N 5 to 10 kt after midnight. Strongest western portion. Wind waves 2 to 3 ft late in the evening, becoming 2 ft or less. W swell 3 to 5 ft at 10 seconds. E winds 5 to 10 kt, becoming SW 10 to 15 kt in the afternoon. Wind waves 2 ft or less. W swell 2 to 3 ft at 10 seconds. W winds 10 to 15 kt, becoming NW 5 to 10 kt after midnight. Wind waves 2 ft or less. W swell 3 ft at 9 seconds. Winds variable 10 kt or less. Wind waves 2 ft or less. W swell 2 ft at 9 seconds. Winds variable 10 kt or less. Wind waves 2 ft or less. W swell 2 to 3 ft at 8 seconds. Winds variable 10 kt or less. Wind waves 2 ft or less. W swell 2 to 3 ft at 12 seconds. Winds variable 10 kt or less. Wind waves 2 ft or less. W swell 2 to 3 ft at 10 seconds. SW winds 5 to 10 kt. Wind waves 2 ft or less. 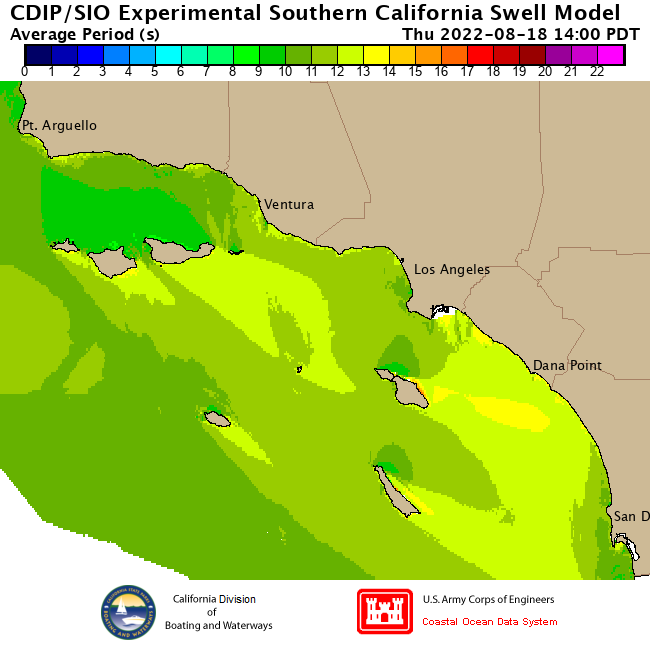 W swell 2 to 3 ft.
W winds 10 to 15 kt, becoming 5 to 10 kt after midnight. Wind waves 2 to 3 ft late in the evening, becoming 2 ft or less. W swell 3 to 4 ft at 10 seconds. E winds 10 to 15 kt, becoming SW in the afternoon. Wind waves 2 ft or less. W swell 2 ft at 10 seconds. W winds 10 to 15 kt, becoming S 5 to 10 kt after midnight. Wind waves 2 ft or less. W swell 2 to 3 ft at 9 seconds. Winds variable 10 kt or less, becoming SW 10 kt in the afternoon. Wind waves 2 ft or less. W swell 2 ft at 9 seconds. Winds variable 10 kt or less. Wind waves 2 ft or less. W swell 2 ft at 8 seconds. Winds variable 10 kt or less, becoming SW 10 kt in the afternoon. Wind waves 2 ft or less. W swell 2 ft at 12 seconds. SW winds 10 kt in the evening, becoming variable 10 kt or less. Wind waves 2 ft or less. W swell 2 ft at 11 seconds. SW winds 5 to 10 kt. Wind waves 2 ft or less. W swell 2 ft.
SW winds 10 to 15 kt. Wind waves 2 ft or less. W swell 2 ft.